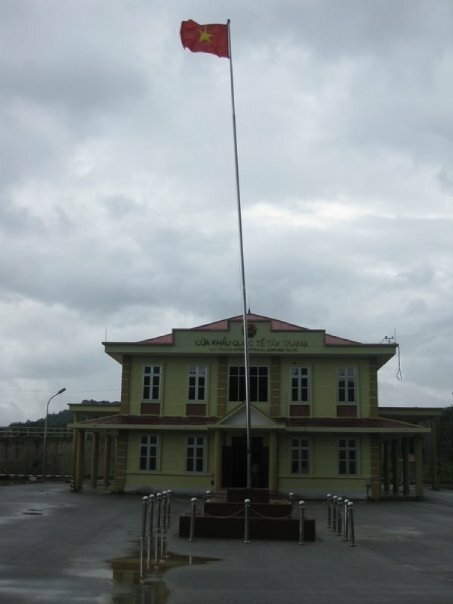 The remote Tay Trang border crossing between northern Lao PDR and northern Vietnam. Many Vietnamese businessmen/businesswomen purchase fresh vegetables in Laos and sell in Vietnam. Other hand-made products such as carpets are also “exported’ from Laos for sale in Vietnam. It’s a long 1.5 days bus journey to get to this crossing from Luang Prabang, Laos (June 2009). I had travelled from Luang Prabang to Oudomxai (6 hours) and then to Muong Khoa (4 hours). I was lucky to catch the last bus to Muong Khoa, otherwise I would have ended up spending a night in Oudomxai. After spending a night in Muong Khoa, a picturesque riverside village in the hills, I took an early morning bus to Dien Bien Phu, Vietnam (10 hours by bus, including 2 hours wasted in road blocks). This border crossing is very close to Dien Bien Phu (DBP). From DBP one can catch a bus to either Hanoi or Sapa. I was heading to Sapa. The distance as the crow flies from Luang Prabang to Sapa is deceptively short. In reality, it takes at least 3 days (10hours of bus journey on each day) to get there due to the long winding mountainous roads.